Since I put my original post out in blogland with the pattern to make this smock I have probably had more blog hits with this search than any other. Several people have asked for more detail as to how to actually make the smock so with apologies to those who don’t need this I will go ahead. 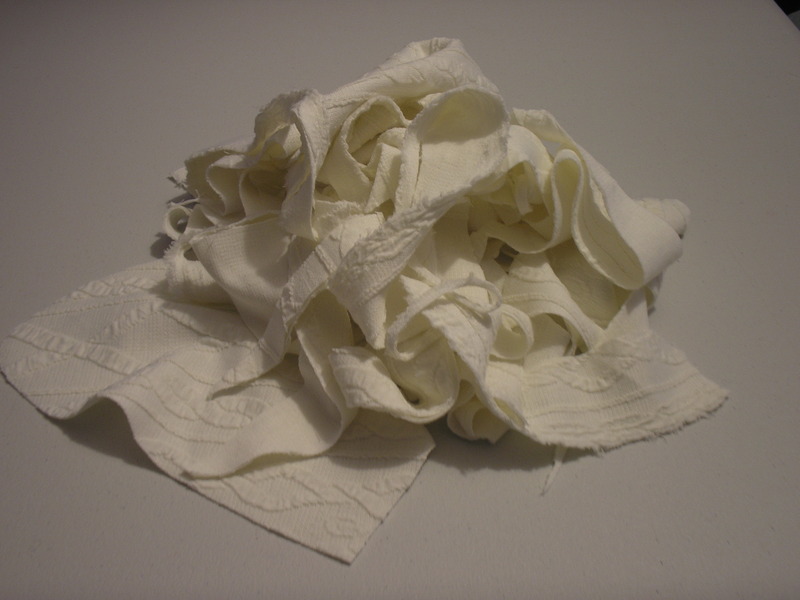 This post is of necessity picture heavy – if you aren’t interested in how to make a smock I will have something else to show soon (but it has been such a success that it needs to be laundered before I can get a photograph!). So, assuming you have cut out your pieces (remembering to add seam allowances to my pattern) we will make a start. Don’t forget to press as you go. 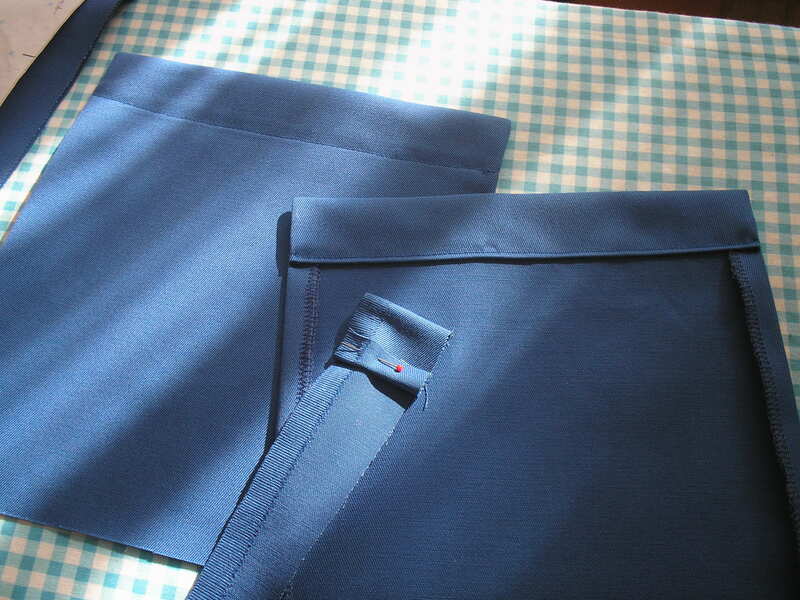 I prepare the pockets first by neatening the sides (overlocker in my case), and turning 1cm then 3cm the opposite way so it is RS together to get a clean finish on the top edge. The little piece of fabric shows this. 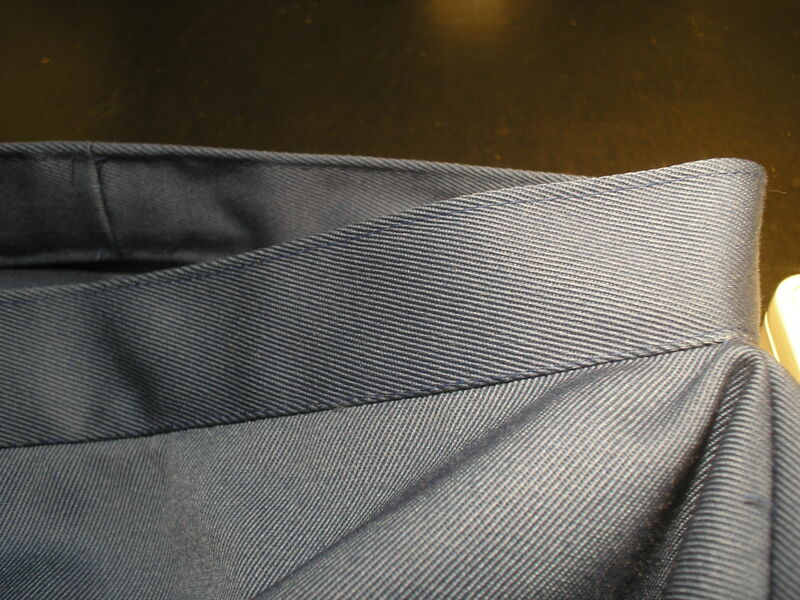 Seam the top edge, press and turn through like the right hand pocket in the photograph. Stitch the turning to secure if you want (like the left pocket). 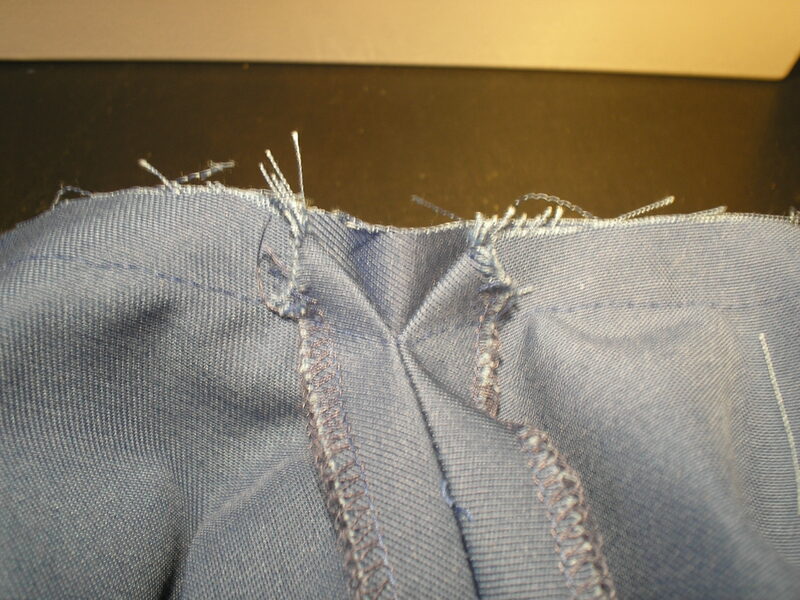 Stitch the pockets into place on the front piece, like below. 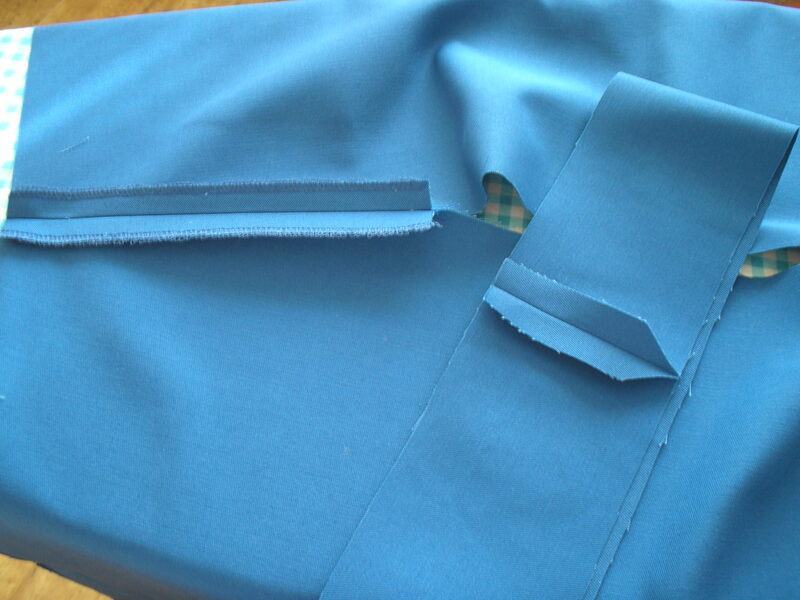 Next sew your shoulder seams BUT stop the seam width away from the neck edge. 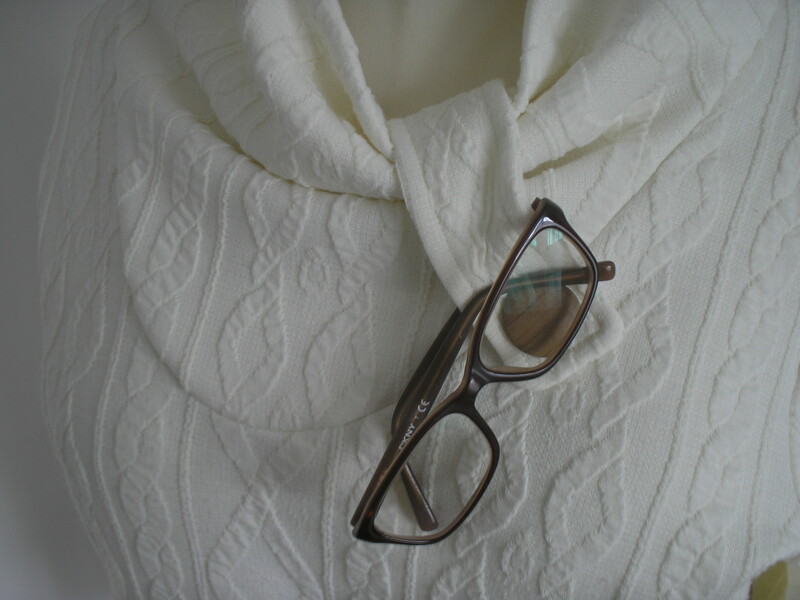 Sew the collar piece into a loop. Press seams open. Neaten the shoulder seams if you wish, and now would be a good time to neaten any other edges that need it. 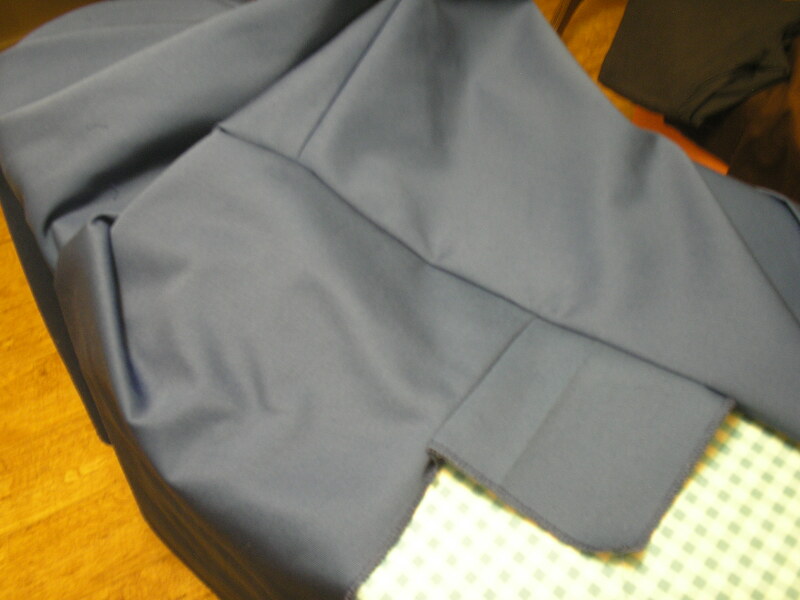 I place the collar seam at the centre back point and pin the collar to secure whilst I see it in place. By keeping the body sides on top you can spread the shoulder like it is shown in the photograph below and sew the collar seam so that you miss the join by a hairs breadth. This ensures you won’t get a hole. 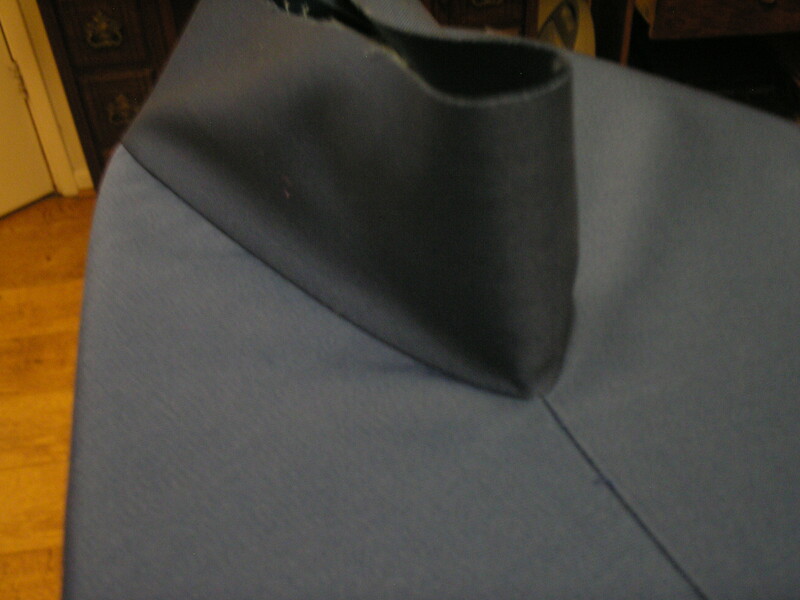 By working the collar seam in this way you will get a nice smooth finish at the join. 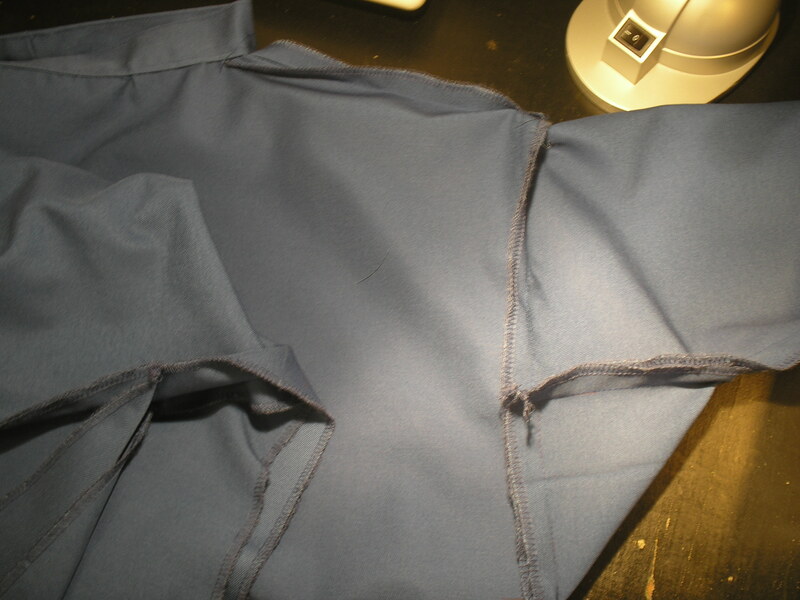 If you had sewn the whole seam you always end up with tucks at this point. Turn under 1cm to neaten the collar edge, then fold the collar in half and catch it in place just in the ditch from the right side. If you edge stitch this just inside the collar it should all be secured in place. Feel free to tack this in place if it will enable you to continue with confidence. While it isn’t essential I like to stitch around the top edge as I think it gives a neater finish. Grab the sleeves and pin them into place. 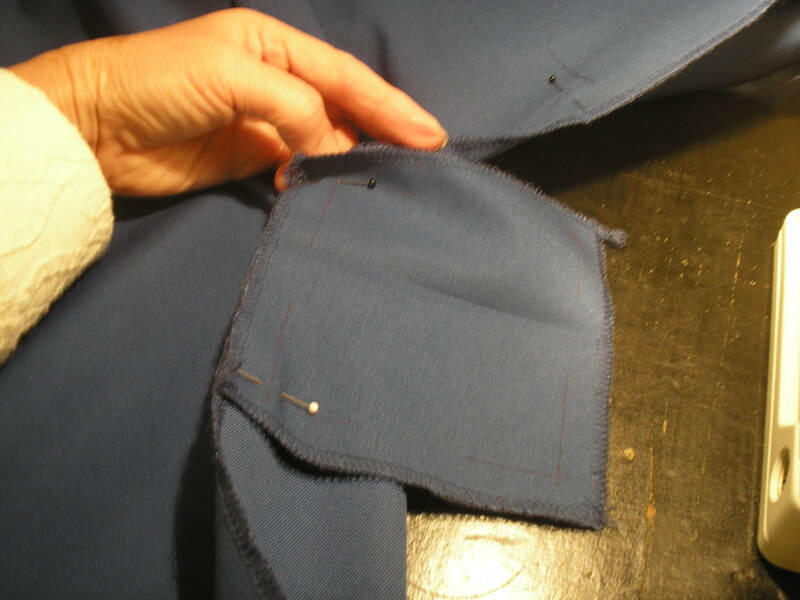 Again you must start and finish your seam the seam width away from the sleeve edge. Now, the gusset. This seems to be the part that upsets many people but stay strong. Don’t think of this as something that needs to be sewn all at once, it can be broken down into four parts. I suggest that you buy yourself a Frixion pen and use it to mark the seams into the corners of your gusset. 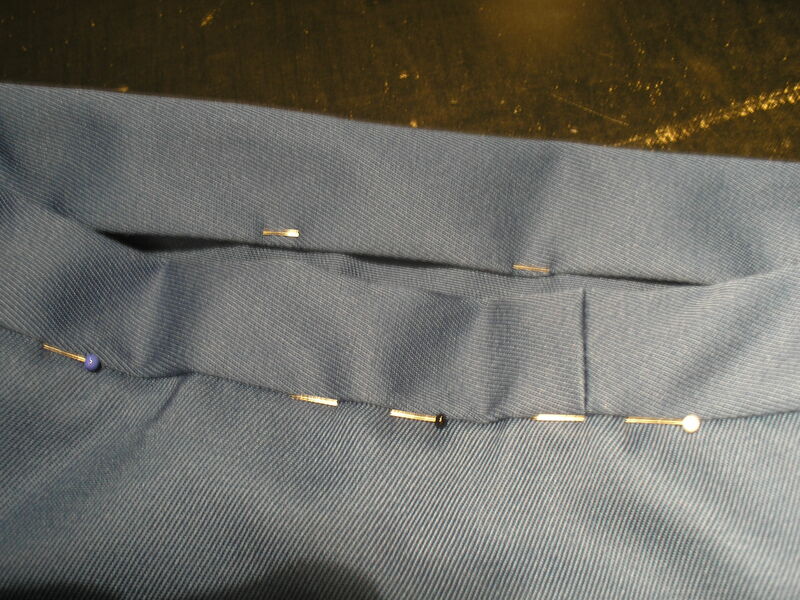 Use a pin as a guide to pin close to the sleeve/body seam and pin the gusset to the sleeve. Again you need to stop your seam at the corner point marked. 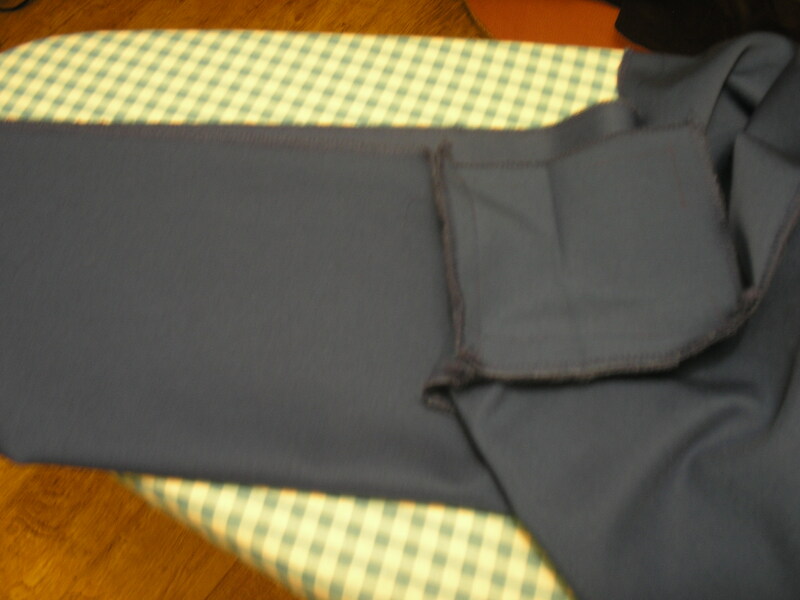 Once you are happy you have the gusset correctly attached to the sleeve turn the garment through 90* so that you are able to use the pin again to locate the matching point on the body. 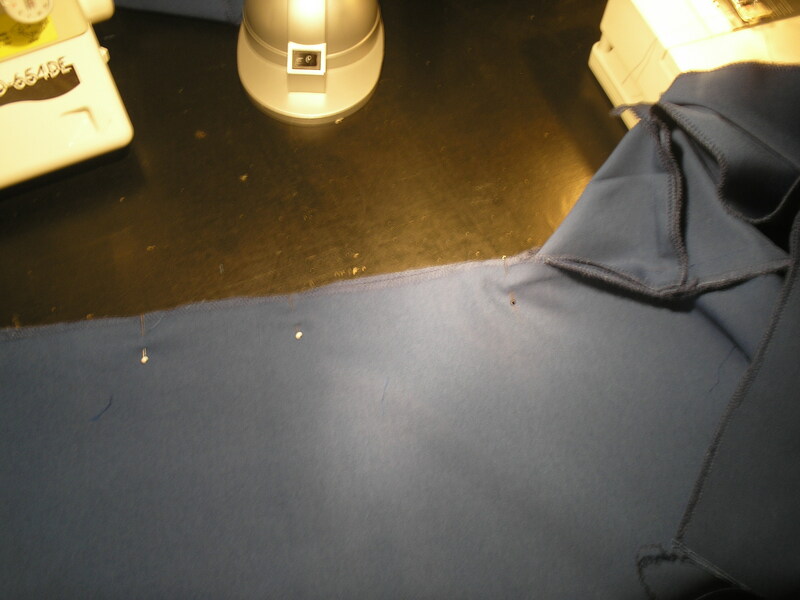 You might find it easier to sew from the garment side so you can see where the other stitching starts. 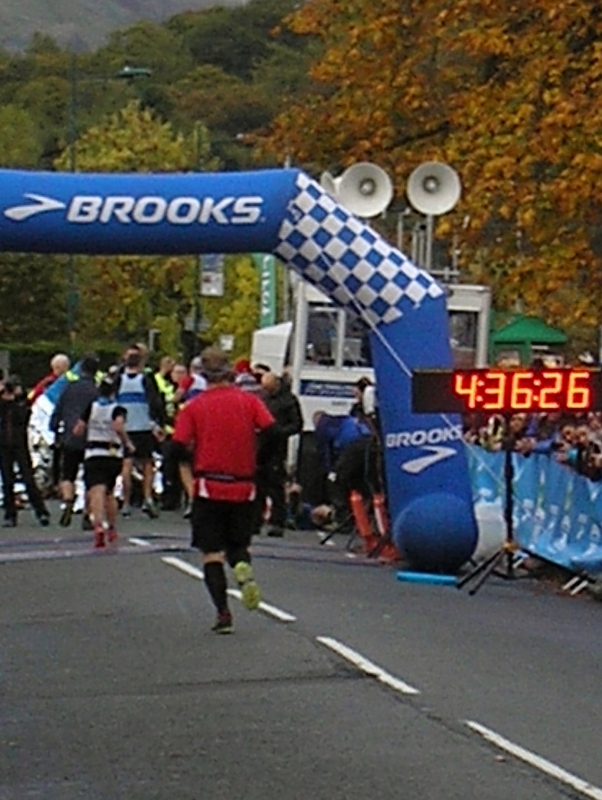 This is what it looks like from the right side at this point…. …. and from the wrong side. 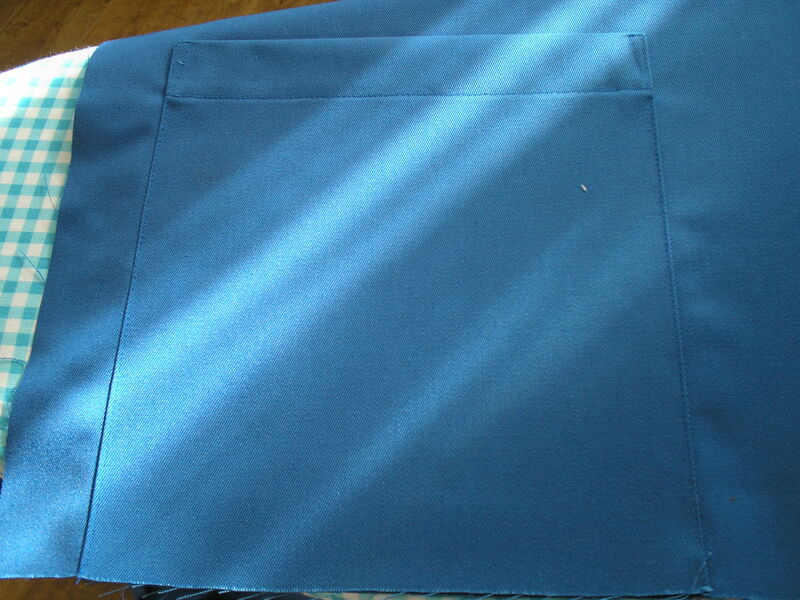 Now fold the sleeve right sides together and you will see where the third seam must be sewn. Use the techniques you learned on the first two sides to complete all four sides of the gusset. 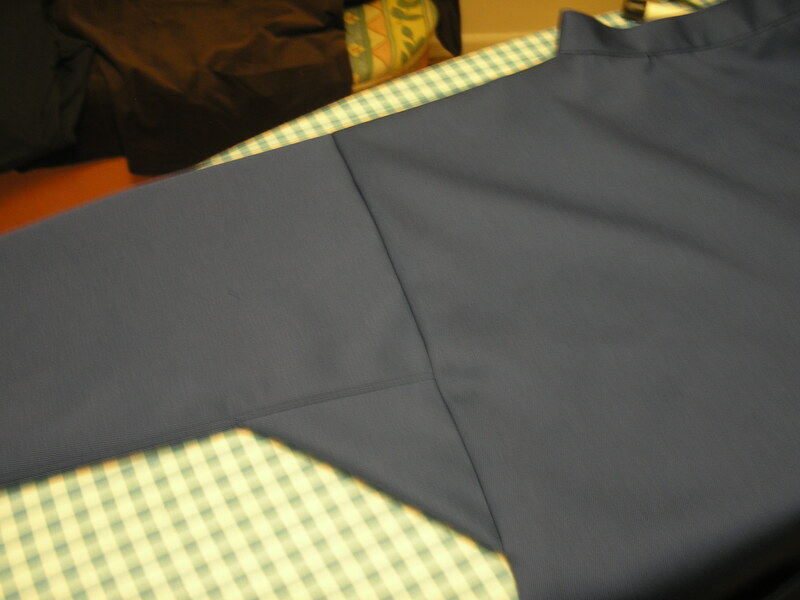 Once you are satisfied that the four sides have been sewn accurately you can sew the sleeve and body seams. I tend to sew towards the gusset which enables you to see exactly where the seam needs to join the gusset, make sure you don’t catch the gusset edge in the seam. Once sewn you can see how the gusset makes a triangle shape in the underarm which allows free movement. All that needs to be done now is to hem the sleeves and the bottom of the body. I clean finished the sleeves (in the same way as the pocket top) but just turned the overlocked bottom edge as the pockets would have made this very thick if turned twice. Press it all tidy, allow to cool and set up your easel! 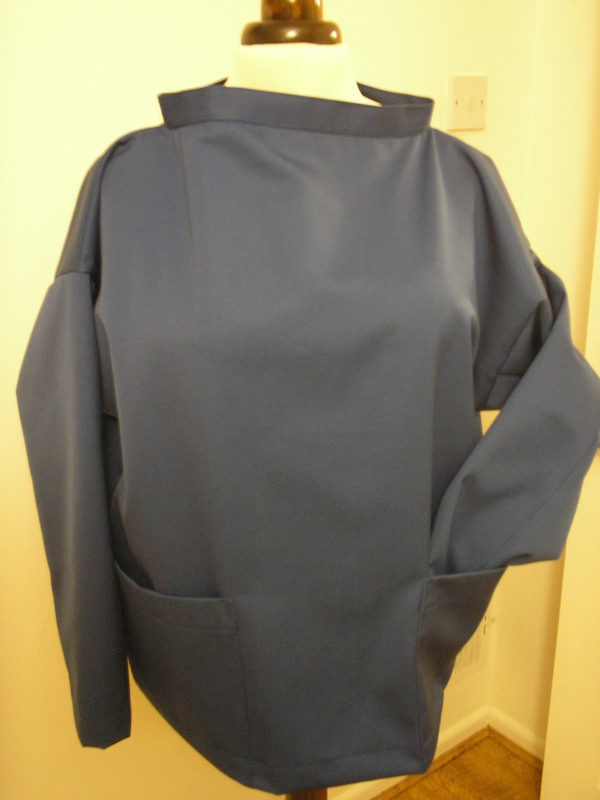 I made this smock from cotton twill (the first couple of photos give the best representation of the royal blue colour) basically to show the techniques here. If anyone is interested in buying it from me for £40 + postage please let me know. I would also be able to create a ‘kit’ containing the pattern and sufficient baby cord shown in my original post in either chocolate brown or a beige colour which would cost £15 + postage. When I work out how it is done I can offer PayPal details. I hope this answers any questions that people have asked but if you have one I have missed please point it out to me! 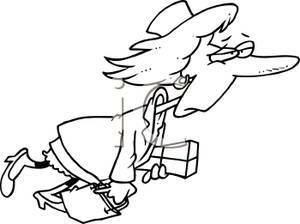 The Management caught the well known ‘aeroplane cold’ which he promptly passed on to me. 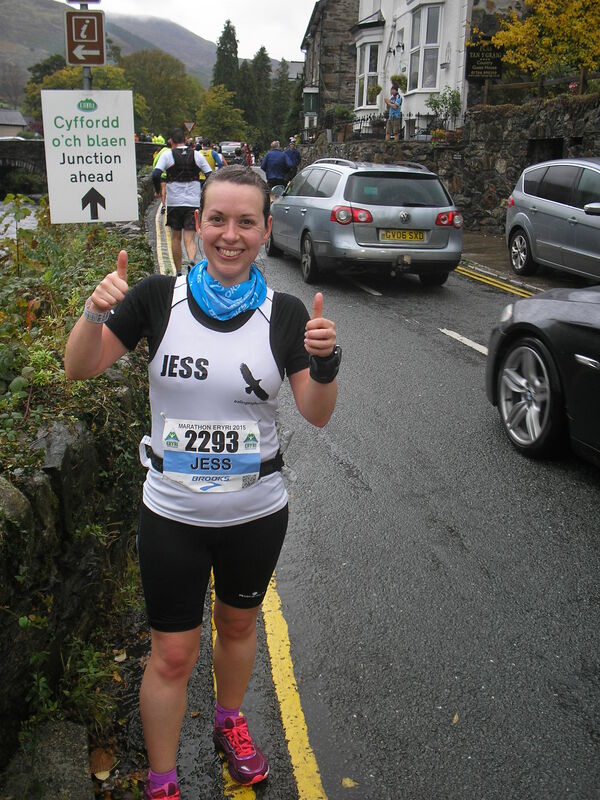 I have been feeling pretty gruesome since Saturday and think I have a few days of being kind to myself left before I jump properly back into life. I’m sure a good nights sleep in the spare bed will sort me out (along with a ‘hot toddy’ – whisky, honey and hot water for the uninitiated). I’m starting to fret about not being able to swim but I think I have factored enough ‘snafu’ time into the calculations. However, before I checked out with the world I did manage to complete the Paprika Patterns Jasper sweater dress I had planned. I like to make the first project after getting home from a holiday something relatively simple to ‘get back into the swing’ and this seemed perfect. The pattern was bought right at the start of September in the Indie pattern bundle and so far it is the only one I have done anything with despite some of the others being really appealing. There were a lot of sheets printed for the pattern – I don’t remember having a larger number to tape together but that may just be my diminished mental state. Despite that it was easy to tape together BUT there is a void in the taping where there would have been an unprinted sheet in the mix. It may have been that my printer was being clever and not putting the sheet in there, or I may have just outsorted it without thinking. Anyway, if you are about to make this up you are fore warned. There is a copy shop option provided if you prefer to do that. I bought the navy sweatshirting fabric from Minerva Crafts before I went on holiday and had already washed and tumble dried it to preshrink. This is listed as a clearance fabric but is still in stock today. 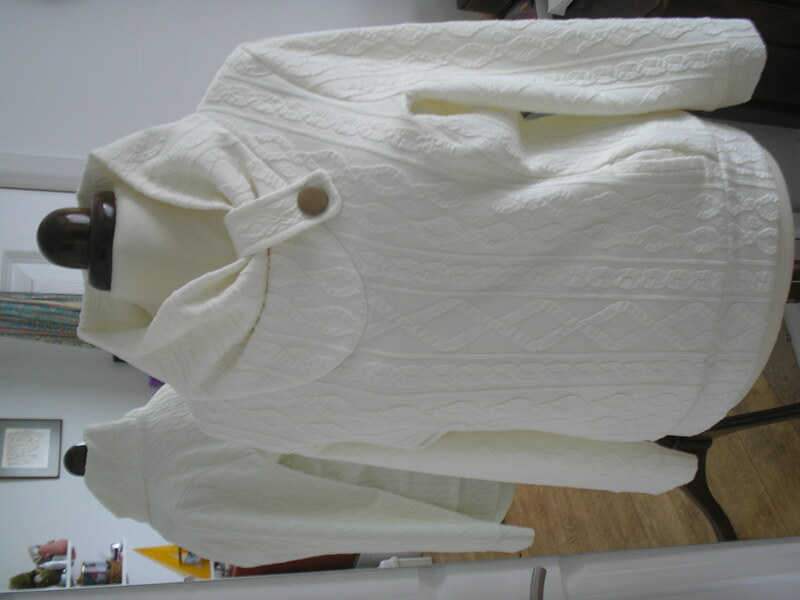 It is a lovely soft fabric, but with enough body to make it just right for this style. It did shed what seemed like a scary amount of fluff in the drier but is still very cozy. The pattern is listed as a two out of three circle(?) 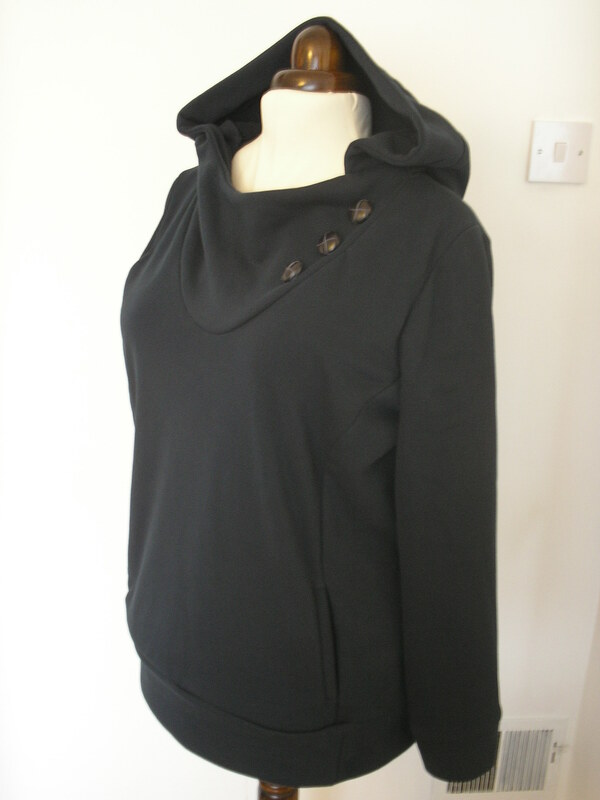 sewing level – mid range I suppose – it does have single welt pockets and that glorious hood. Don’t let them scare you. The instructions are backed up with online tutorials if you aren’t understanding the written instructions, and the results are worth the effort. I finished this on Friday (just after I knocked the iron off the board – it was switched off thankfully – and killed it) and took one lot of photographs which were all rubbish. I repeated the exercise with Bessie modeling this morning as blogland really doesn’t need to be aware of just how gruesome I look at the moment. The kangaroo pocket is wonderful for stuffing cold hands into, and even though it looks really stupid wearing it indoors the hood is lovely. I seem to remember someone describing the hood as being ‘monastic’ and I can kind of get that (sorry, I can’t remember who at the moment). The button detail is nice but I decided not to make too much of it on this version as I wanted something casual and understated. 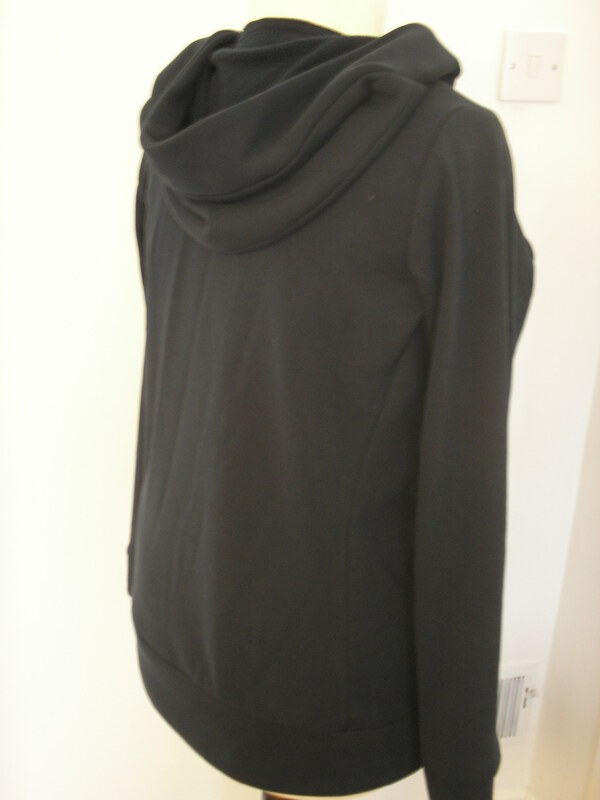 The princess seams give a bit more shape than might be expected of a sweatshirt which is great and gives extra options for adjustment. Will I be making this again? You betcha. 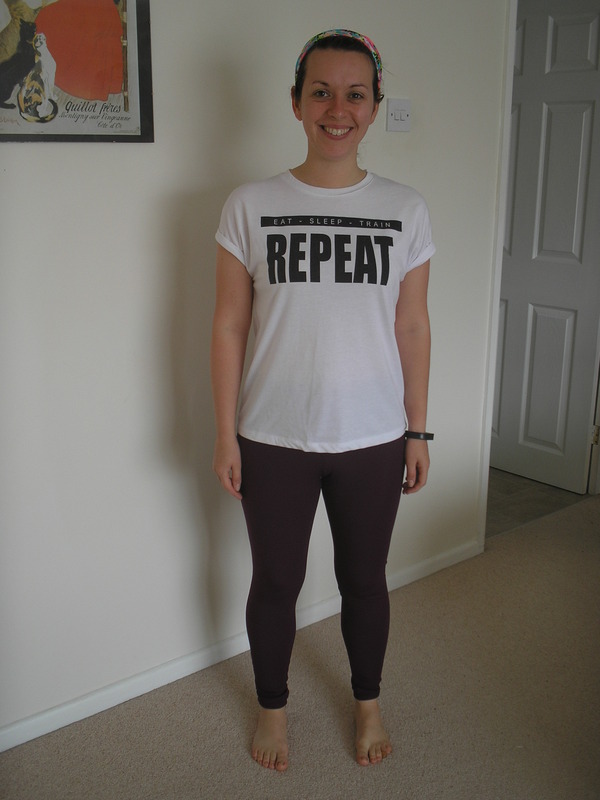 Maybe the dress length version next time…..